Whether you've already bought a kayak or you plan to do so soon, it's worth noting that many manufacturers don't include paddles. If they do, they're probably low quality and less likely to handle your necessities. This is when we come in to make your life easier. 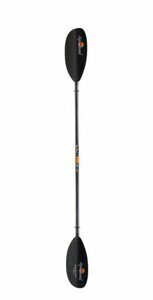 Our Aquabound Paddle review floats around one of the best rated paddles out there. From our point of view, it's good enough to be appealing to professionals, and at the same time, offers a good value price that is attractive to every kayak enthusiasts. Here is a quick recap on what we think of this paddle. Available in multiple sizes from 210cm to 250cm, AquaBound's flagship is certainly one of the best rated paddles on the market. Not only it looks good, but it also takes your performance, comfort and experience to a new level. We believe this is one of those paddles that will help you realize how much difference a quality model will make in your kayaking experience. The two piece construction is the first thing we had to include in our review. It's not an innovation in this industry, but AquaBound has managed to make it perfect. It has a snap button ferrule that allows breaking into two pieces within one second. It can be stored and transported with no issues at all. There's a common misconception regarding this design. Old paddles used to become loose after a few months of everyday snapping. That's what makes AquaBound's model so well rated – you can use it forever without having to worry about its performance. 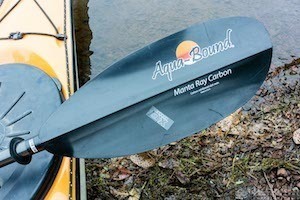 The carbon construction makes this paddle extremely lightweight – not more than 3.52 pounds. Maneuvering your kayak will be a breeze, even on long camping excursions. The shaft is entirely made of carbon. As for the blades, they are carbon reinforced. Carbon is more common in whitewater paddles, but it's not a general rule. This paddle is a multipurpose model that carries some professional characteristics. In other words, it will enhance your kayaking experience regardless of your style. The angle varies widely from one paddle to another. As a general rule, the higher it is, the more you can do with the paddle. Simply put, anyone can use a high angle paddle, but not anyone can do with a low angle alternative. The angle is given by the position of one blade compared to the other, as well as the blade size. This model comes with wide blades. We found it to be a bit harder in the beginning, but we got used to it. The best part is it gives you the most out of every single stroke. It's basically designed with efficiency in mind. As if all these were not enough, each blade comes with perfect dihedral. It ensures a smooth paddling experience, but it also clears blade flutter. All Aqua Bound paddles are made in the USA. It doesn't mean that paddles made in other countries are worthless. Instead, it means these models must raise to specific standards in order to pass the industry regulations. In terms of quality and durability, there's nothing to worry about. Another good news is that these paddles are hand-built and not created by some machines. They're inspected for imperfections prior to go for sale. It's lightweight and easy to handle. The two piece construction makes it easy to store and transport. The wide blades provide a smooth operation. It has a flutter free design. It's available in multiple sizes. First of all, decide whether you want this paddle for a kayak only or boats as well. If you plan to use it for the kayak, you'll need a double bladed paddle. When it comes to canoes, you'll need a single bladed paddle. Some double bladed paddles come with removable blades for an easy conversion. The length is another major consideration. It depends on multiple factors, but most importantly, it's directly proportional with your height. Your arm span is not to be overlooked either. There are multiple guides out there with slight differences. For instance, a 5'11” male might require a 200cm paddle for whitewater trips, as well as a shorter paddle for freestyle tricks and a longer paddle for race slalom. Forget about these small details though, but focus on one size, like most people. There's a particular angle that a blade is offset from the other. This measurement is known as the feather of the paddle and varies from one unit to another. It goes up or down in 5 degree increments. Most people will stick to a general value of 45 degrees. Now, are you left or right handed? The dominant hand will provide a stronger grip. It's going to be tight there and loose in the other side. Most paddles are designed for right handed people though. Also, they're considered to be general, unless you plan to become a professional. You will naturally adapt and learn to keep the kayak straight. The type is just as important. Ideally, you should go for a general purpose paddle. This is where most beginners start this venture. An all round paddle is usually made of aluminum, while the blades are made of plastic. It's heavier than specialized paddles, but there are no other drawbacks. It's cheaper and usually measures 200cm. Whitetaker paddles are usually made from composite materials, such as carbon. They're obviously lighter, but also more expensive. Touring paddles go even further – longer and lighter. Chances are even as you'll get more experience, you won't make kayaking a lifestyle, but a relaxing recreational activity for family and friends. We believe it makes more sense to invest in a general or a slightly specialized paddle that can support most kayaking techniques out there. It won't cost you a fortune and it will successfully handle your necessities. Finding fishing kayak paddles is one thing and using them correctly is another thing. We put together a few helpful tips for beginners. Holding the fishing paddle correctly is essential. Orientate the blades accordingly, adjust where you grip and relax your hands. To orientate the blades, they must be perpendicular to the ground surface, with the large knuckles up. The concave side should face you. To adjust the shaft you have to place it on your head and make sure your elbows are bent at a 90 degree angle. As a short final conclusion, this industry is quite diversified. It can only tell you one thing – those paddles that some kayaks come with are there just to boost the kayak price. Their quality is not the highest, hence the necessity to invest in a proper unit. Our AquaBound paddle review tries to take the hassle off your shoulders. We've identified the most general paddle on the market, as well as a top seller. Overall, buyers rate it at 4.6 out of 5 stars. We believe it is worth 5 stars. After all, it's durable, lightweight and ideal for pretty much any situation, while its size is suitable to most people.